Don’t forget that you can wishlist Shadowhand now on Steam! With launch day for Shadowhand just ten days away on December 7th, we are excited that so many people can’t wait to play the game. Fortunately our publisher, Positech Games, is currently working on many aspects of promotion so that we can concentrate on testing and last-minute details. The game was finally content complete on 22nd November – until that point we had various enemy artwork and levels that we had designed that had not all been slotted into the game. Every detail is mapped out on spreadsheets first. That’s right, until a few weeks before launch the game in its entirety only existed in our heads and in Excel. Jake has been doing stirling work balancing the battle elements in Shadowhand. We have numerous meetings to talk through consumable items, weapon damage and effects, enemy and player stats and so on. This ties in to level design and difficulty. I designed the levels, which we then order and edit together to fit their final location in the game. As well as the more obvious enemy health and defense, there are a number of factors that we can use behind the scenes, such as tweaking the intelligence of the enemy AI, to ensure that players get a fight that is just challenging enough. After balancing the first half of the game and automated testing, it’s back to me (and soon a number of beta testers) to play test the game. Inevitably we have found a few issues with level design that mean we will have to make changes. But of course I’m also looking for the difficulty and fun factor, whether the game economy works, and flagging up any frustrations. The good news is that I’m loving it! Our plan was to use a card game to drive an RPG with a lot of player choice and customisation. I honestly think that we have delivered. As I was testing, I felt this every time my enemy scored a health-giving steak and ale pie during a battle and I coveted his lunch. I was delighted each time one of my swords delivered a surprise counter attack. I spent a while pondering whether to wear a corset that protected me from stun or bleeding…and I wore my ruffian beard, both an excellent disguise and to boost my stealth. The rapier I’ve selected comes with a chance to counter attack, and because it is a “sea” class weapon the Swashbuckler Swordbelt, designed to go with sea swords, boosts its damage by 10%. 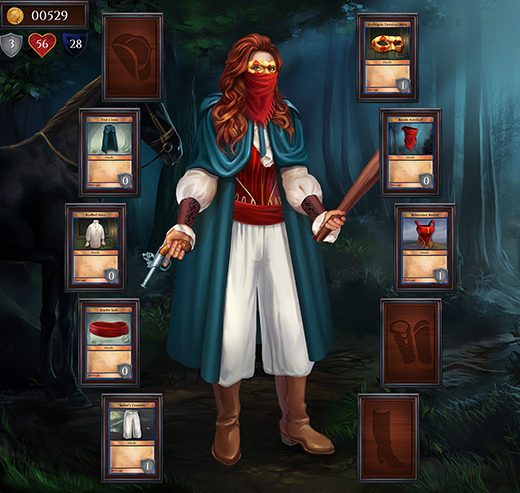 At this stage in the game Shadowhand could equally be wielding a club, an axe, a duelling pistol or any number of other weapons. For her off hand I’ve chosen a blunderbuss that comes with a built-in chance to stun. This waistcoat is also anti-stun (I’ve just come fresh from a fight with a bludgeoning enemy). 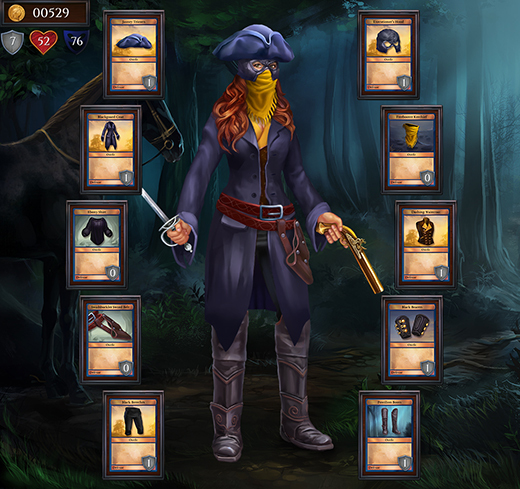 My breeches, shirt, bracers and hood all stack to boost stealth – the chance to go first in fights. Other items, like my hat and boots, add to my character’s defense. There’s more testing and level polishing to do, as well as finalising Steam achievements and a host of other tasks. Onward! Shadowhand is coming to Windows 7 OSX on 7th December 2017, and will be priced $14.99 (With a one week launch discount of 10%). On release day, the game will be availble from Steam, GOG, The Humble Store and direct from the publishers website at www.positech.co.uk. The developer Grey Alien Games is also the developer of the PC game ‘Regency Solitaire’ (Currently on Steam). Publisher Positech Games has previously released the Gratuitous Space Battles & Democracy games and currently has ‘Production Line’ in Early Access. You are currently browsing the Grey Alien Games weblog archives	for November, 2017.